Sound Sea Villa is one of the five luxury villas that are part of Pantai Lima estate located in peaceful Canggu. 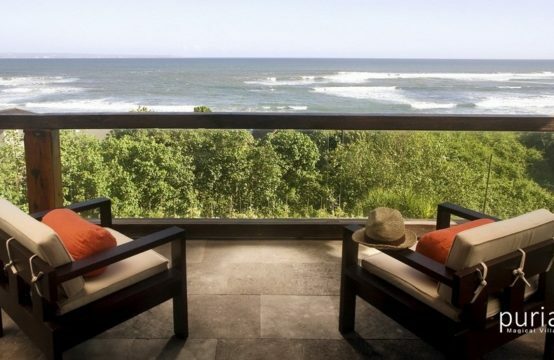 The name already reveals that this is a beach front villa with spectacular view over the ocean. With 5 luxurious bedrooms, a massive garden and amazing facilities, this villa is a dream come true for large families or groups of friends and it’s also an excellent wedding location. The master suite has the best ocean view from it’s private balcony that features a comfy day-bed and also a large sunken bathtub. Inside the room is furnished with a beautiful rattan king-size bed and a plush purple sofa where you can curl up together watching a movie on the flat-screen TV with DVD-player. In the wardrobe closets you will find a a fridge, a safety box and kimono with slippers. The 4 guest bedrooms are all spacious and luxurious with a chic marble flooring and high-pitched Balinese rooftops. Each room has a plush queen-size beds, a TV with DVD-player, a dressing-rooms and bathroom with a luxurious bathtub. The spacious living pavilion is designed open to the garden and it has a traditional alang-alang roof with a stunning chandelier hanging from the high soaring ceiling, illuminating the pavilion beautifully in the evening. Sound Of The Sea Villa built right on coast with 30 meters unobstructed beach front setting. At the moment guests stepping their foot from garden to the sand, magical pictures of Pererenan Beach shall captivate them. Sound Of The Sea Villa is one beachfront villa of Pantai Lima Estate. Situated on on Bali west coast, Pererenan Beach, 25 minutes driving to north from Seminyak wide, through asphalted road surrounded by ricefields, that leads to a tranquil, secluded beach. And Behold! Great beauty of nature together with your family, on truly memorable pleasant retreat. The villa houses 5 unique fully airconditioned bathrooms which will amaze you. This is the bedroom with the closest balcony to the beach on the whole island. The wave bedroom has direct access to the library, which can also be used as a children bedroom. The closest bedroom to the beach on the whole island. One step will take you to the garden, a few more steps to the sand. Enjoy your own secret garden. This bedroom offers a walk-in dressing and a traditional ambiance. Enjoy your own secret garden. This bedroom offers a walk-in dressing and a very romantic bathroom. Enjoy the seaview from your bathtub or your bed. This light and airy bedroom will relax your senses. A library room with a desk and sofa is situated next to a bedroom. It can also be turned into an extra double bedroom. Each bedroom has its own 37 inch LCD television screen with satellite tv programming, dvd and Bose sound system. There’s an iPod dock which is connected to speakers throughout the villa and the garden. There’s a substantial media room with a High Definition movie projection system, plus a library of the latest films on dvd. The entire estate is covered by an unlimited WiFi satellite broadband system which is yours to enjoy while you are our guest. Every bedroom has an ISD capable telephone. Calls between rooms don’t cost anything. Local or international calls are charged at cost. Sound of the Sea’s water is drawn from a deep well, then filtered and treated with ultra-violet to make it completely drinkable directly from the tap. Still and sparkling mineral waters are also available as a matter of course. Your beachfront garden stops where the beach sand starts. This large garden is the perfect place to throw a party and admire the sunsets Villa Sound of the Sea is famous for. At the back, a more intimate garden -with lush vegetation and traditional statues and temples- gives you a real Balinese atmosphere. A library room with a desk and sofa is situated next to a bedroom. It can also be turned into an extra double bedroom. Villa Sound of the Sea has two pools. The infinity pool who is 20 meters long seems to end in the sea. Surrounded by a wall of lava stone, it is not easily accessible by young children. The second pool is a child shaded pool with a max depth of 60cm. Your kids can play in the water for hours without any risks of sunburn. Right in the front of the beach, you will find a beachfront Jacuzzi designed for the enjoyment of up to six adults. There’s a tennis court with all-weather surface and night-lighting that’s yours to enjoy. Our pro guests have ranked our tennis court many times as the best one in the island. A selection of fitness equipment is also available should you want something more strenuous than long beach walks to keep in shape.